This online Master of Science (MS) in Education concentration prepares educators and related professionals to consider the effective application of technologies for learning in recognition of the changing roles of educators in preK-12, higher education, corporate, and entrepreneurial environments. Formerly known as the Technology for Educators MS program, the courses have recently been updated to represent a focus on the evolving field of learning science and the ways in which technology might support this evolution. 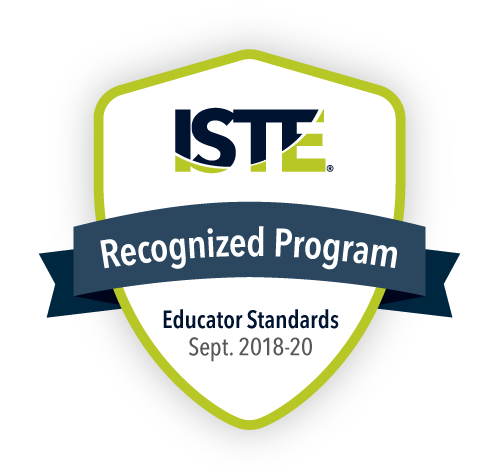 The program is aligned with the 2017 release of the International Society for Technology in Education (ISTE) Standards for Educators, as well as learning theories from the National Academies of Science’s initiatives on the new science of learning. The knowledge base within the program comes from both existing and emerging methods for effective technology training and effective leadership including policy, practice, research, wisdom, theory, culturally responsive education, and legislation. The courses involve project based learning and collaborative planning. Candidates gain competencies in learning science, instructional design, systems change, Universal Design for Learning, and evaluation of emerging technologies. Note: This class should be taken first. New technologies are part of the intellectual landscape in which new kinds of knowledge are breaking down the boundaries of previous distinct disciplines. The design and use of new technologies make possible new approaches to learning, new contexts for learning, new tools to support learning, and new understandings of the dynamics of the learning process itself. This course examines the role of technology relative to the key concepts of active learning, metacognition, and transfer of knowledge from multidisciplinary perspectives on learning. Based on the science of learning, students will develop and implement technology related strategies that align educational technology to standards-based instruction, promote problem solving and higher-order thinking skills, facilitate cooperative learning, and use reflective teaching and inductive approaches to increase student achievement. Students must take Technology and the Science of Learning as one of their first courses in the program. Candidates will explore the social, organizational, and structural factors influencing educational opportunities, experiences, and outcomes of culturally diverse students. Through personal reflection and analysis, candidates will determine the best way for them to positively impact students, regardless of ethnicity, gender, socioeconomic status, sexual orientation, etc. Course content is aligned with the Maryland Common Core Curriculum employed by partnership schools. Note: Should be taken at the end. The advanced applications course provides students the opportunity to individualize their program experience, to sharpen existing skills, to gain new skills, and to pursue their educational technology interests related to curriculum and professional development in support of technology-based programs. Students work with their advisor to create a professional, customized learning experience that stretches the student through his/her participation in the development, design, implementation, or evaluation of high-quality technology products, projects, or services. The activities in this course are aligned to individual student’s schedules and can include collaborative opportunities with public and private sector organizations and agencies that have local, regional, national, or international interests. This course supports the development of leadership expertise in an area designated by the student as a set of skills needed to advance the individual in their chosen area of study and professional practice. The graduate seminar is the capstone course in the program and reflects students’ individual mastery for leveraging technology with diverse learning populations. The seminar focuses on examining the constructs of educational technology topics and culminates in the student creation of his or her online portfolio. The portfolio showcases the products and skills developed by learners during the core courses throughout the term of their academic studies. The goals of the seminar are to engage and support participants in understanding the historical, cognitive, technical, political, and sociological issues involved in the effective use of technology in education and particularly in the integration of technology into instruction. Participants explore the possible ways technology can be integrated with core content standards. Technology enhanced progress tracking, evaluation and measurement tools are explored from both a hardware and software perspective. Online resources utilized to enhance curriculum and classroom learning are investigated, evaluated and discussed in an open forum. Students explore untapped technology resources and work collaboratively to design and develop learning opportunities aligned with their professional context. This course can be taken in place of one (1) of the required courses. Electives taken from other programs must be approved by the advisor. This online course is designed to prepare education professionals to address a major contemporary concern – the access and use of inclusive technologies to meet the needs of diverse learners. Course participants will investigate the role of adaptive and assistive technologies in learning. Course participants will develop the knowledge and skills necessary to select and use inclusive technologies and enabling applications to enhance, augment, and ultimately maximize learning experiences for learners of all abilities. Participants will examine existing inclusive technologies and investigate the potential of emerging technologies to determine how these may contribute to the continuum of technology-based applications for all learners in classroom or workplace settings and across all societal sectors. PLEASE NOTE: Students MAY NOT register for more than six (6) credits in one (1) semester (including summer or in combination with another program) without written approval from their adviser. An email will suffice. Note: Students enrolled in the Master of Science in Education: Digital Age Learning and Educational Technology program may not simultaneously enroll in, nor are they eligible to earn, the Certificate in Graduate Leadership in Technology Integration.